After flying to the Caribbean and the east coast of South America, I wanted to see more of the world. I couldn’t transfer to the Atlantic Division because I couldn’t speak French or German so I asked for a transfer to the Pacific Division. I was accepted and on January 1st 1951 I drove across the country to San Francisco with two other stewardesses. I adored San Francisco. We flew V-trips and W-trips to Hawaii via Los Angeles and also to Asia and the South Pacific. My second trip was a South Pacific trip on the first Stratocruiser to Sydney, Australia but there was no ceremony. The South Pacific route was Hawaii, Fiji, Sydney, Auckland and on the return Fiji, Hawaii and home. It took the crew about two weeks to complete our trip. 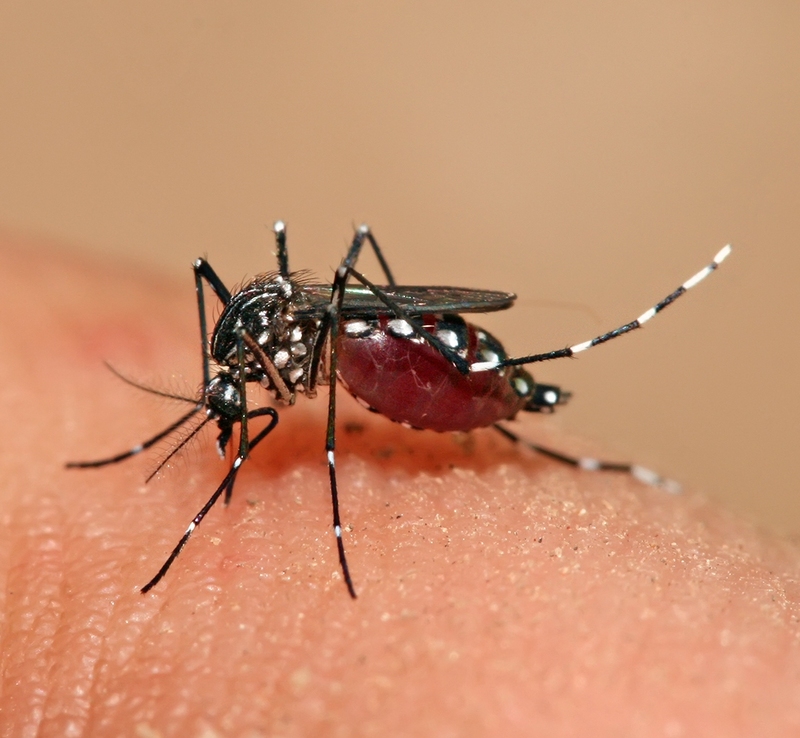 In Fiji I was bitten by a mosquito and got Dengue fever. They didn’t discover it right away because they believed the mosquitoes carrying Dengue fever were only on the Suva side of the island. I never found out who kept the mosquitoes on separate sides of the island! There was no doctor on the island so they flew me back to Honolulu in a berth on the Stratocruiser and I was admitted to Queen’s hospital. The berth smelled so badly of old rubber I could hardly wait to get a shower, but they didn’t have showers so I had to take a bath down the hall. It took me months to get over that fever. 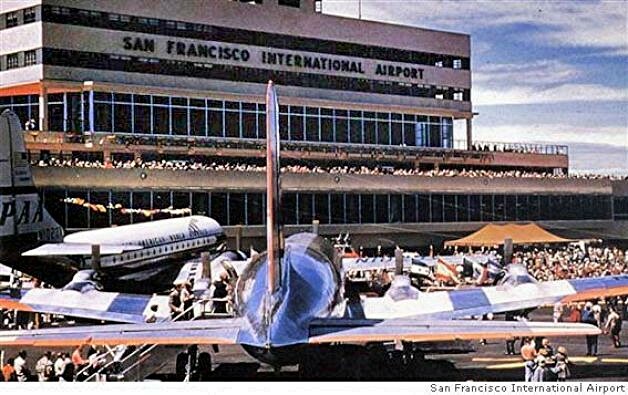 Pan American was the first airline to operate the B-377 Stratocruiser, referred to as the “Guppy.” The inaugural flight was on April 1, 1949 (the same year Lynn began flying) from San Francisco to Honolulu. 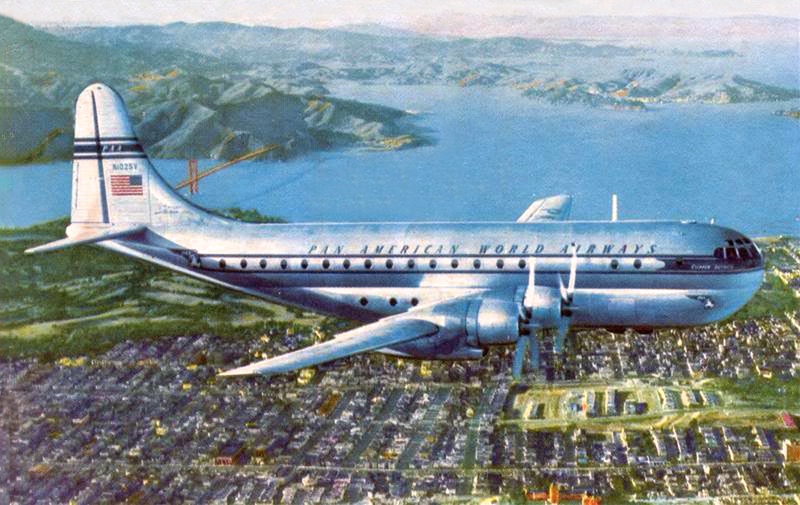 Five cabin attendants worked on the Stratocruiser and it flew about 300 miles per hour at 25,000 feet. Flying time to Honolulu was 8.5 hours rather than 12 on other aircraft. From Hawaii to Asia we flew to Wake Island, Tokyo, Hong Kong, Manilla, Singapore and Bangkok. This was during the Korean War and we also flew the Military Air Transport Service (MATS.) charters in a DC-4 – 14 hours from San Francisco to Honolulu! One leg of the trip would be a regular Pan Am flight and then the next leg would be a MATS charter. On the MATS charters, the pilots and planes were from different airlines. The Western Airlines crew were the nicest. I can remember watching the young soldiers playing craps in the back of the plane by the galley and thinking how very, very young they looked and were. The Asia trips were 28-32 days long, the South Pacific trips about two to three weeks long. You have to remember I flew on propeller planes; it took 11 hours to fly to Hawaii by Stratocruiser and 12 hours in a DC-4. One time a crew member had an American-Japanese friend who was living and working in Japan for an American company. On arrival he met us at the hotel and said “No time to change” he had made dinner reservations at an authentic Japanese restaurant. To back track a little I had a pair of hose that was bluish gray and blended great with my Pan Am blue uniform. As I wore them they kept getting holes in the toes so I would sew up the top of the holes so they wouldn’t create a run up my leg but that still left a hole. Guess you know what happened when we arrived at the restaurant! Off came the shoes at the entrance and there were my toes sticking out! I was so embarrassed. 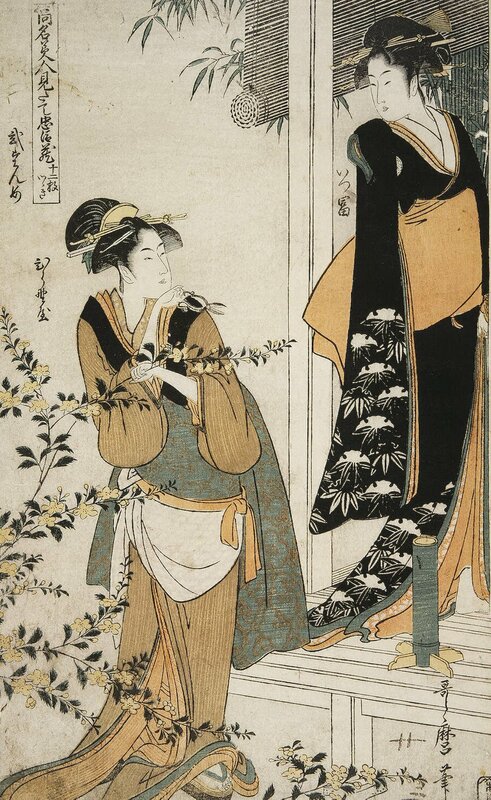 As the dinner progressed, complete with Geishas, the Geishas entertained the men. Through sign language and a couple of words in English I was able to understand that the Geishas were telling the male crew members they would come to their rooms at 6 a.m. the next morning. The poor crew members didn’t understand them, so I finally told them they were coming to the hotel at 6 a.m., but our pick up was at 5 a.m. I never did find out if they got together and I didn’t ask. I did however keep washing out my hose and wearing them until the runs finally went up my leg. My sister Bev drew a picture of my embarrassment on a card for my birthday. What a difference in crews between LAD and PAD. In the Pacific they were more like the military. The flights were longer so they had more crew members. The Captains had a lot of seniority and thought they were God. Because the crews were so big, they weren’t as friendly as the LAD pilots. On my first trip to Honolulu, the crew called my hotel room and said because it was my first trip I owed them a bottle, and to have it sent up to their room. Needless to say I replied “Fat Chance!” I wasn’t invited, just the bottle; there were some nice ones though. 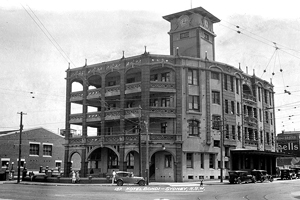 The Moana Hotel had its first guests in 1901. “Moana” in Hawaiian means open seas or ocean. 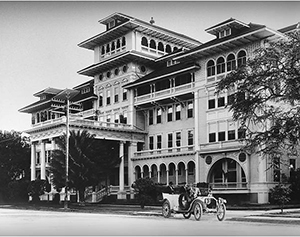 It is known as the First Lady of Waikiki and is listed on the National Register of Historic Places. There were only three hotels in Honolulu then, the Moana (our crew hotel), the Royal Hawaiian, and the Halekulani Cottages. 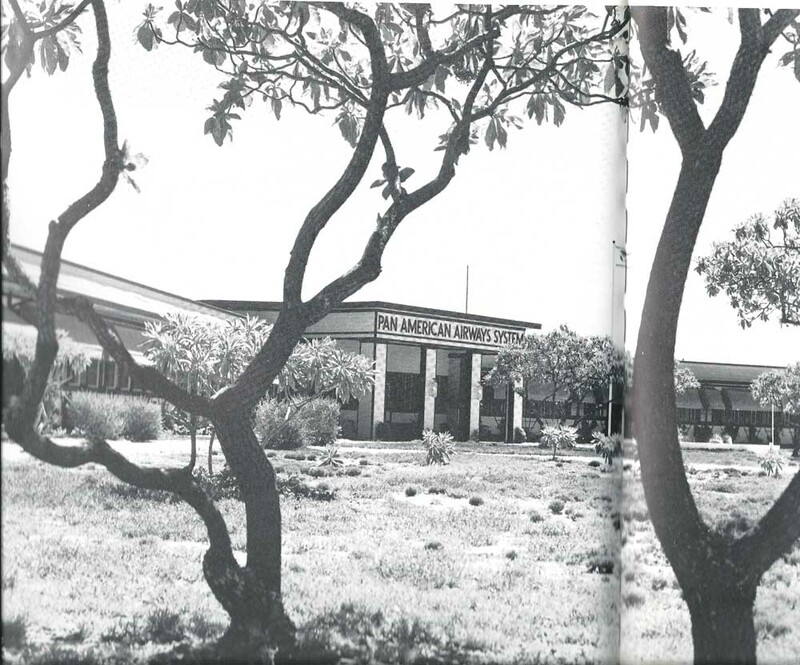 The Moana had cottages across the street from it, which were torn down and the area is now the International Marketplace. 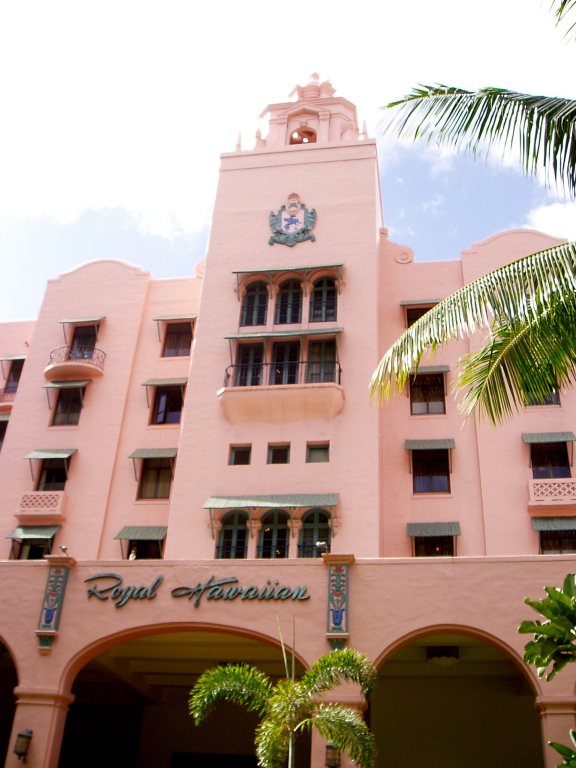 The Royal Hawaiian was called the hotel for the newly wed and the nearly dead. 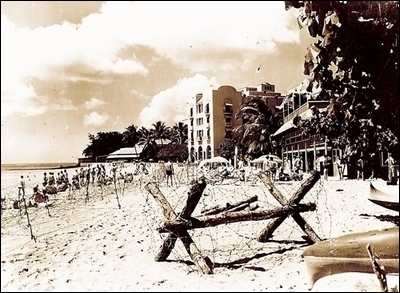 During the war the beach at the Royal Hawaiian hotel was ringed with barbed wire. Speaking again of parties, I remember one morning coming down in the elevator at the Moana Hotel in Honolulu and the elevator boy said “Pan Am had a BIG party last night!” I didn’t know what he was talking about, but when I arrived in the lobby there was my crew and the pilots sitting around looking very sombre and not talking much. It seems a couple of the pilots and two stewardesses were drinking in the pilot’s room and decided that the fire extinguishers in the ceiling were so old they would never go off in case of a fire. They lit a match, and when the extinguishers didn’t go off, they lit an entire book of matches, and did they ever go off! Not only was their room ruined, but the floor as well and the clothing store beneath their room was ruined by water. That curtailed parties for a while. It took that Captain years to pay off damages and he was demoted to First Officer. The Bondi Beach Hotel. “Bondi” or “Boondi” is an Aborginal word meaning water breaking over the rocks. We usually stayed in the best hotels, the Raffles in Singapore, the Peninsula in Hong Kong , the Manilla hotel in Manilla unless it was difficult to find rooms with a bath such as in Sydney. We stayed in an ex red light hotel called The Bondi Beach Hotel as it was the only one that could promise rooms with a bath. There were still some red light connections, which some of the pilots liked. One of the other reasons our trips were so long were because of layover crews and flights that were only twice a week. They always had a rested crew at some stops in case they were needed. Also, because the flights didn’t operate daily, it meant two to four day layovers. We used to have four days in Tokyo going in each direction. Of course layovers in Wake Island were not the greatest. One time I was on a layover in Honolulu and they called me to take a flight to Tokyo. I was on a W-trip and had packed summer clothes. Tokyo was having the worst snow storm it had had in years. So I asked a friend who was heading home that day to call my roommates and ask them to pack a suitcase for me with warm clothes and to send it on the next flight. They did and it arrived about two hours before my pick up! I had a date with a very nice handsome man in San Francisco and he asked me when he could see me again. Since I was leaving on a 32 day trip to Asia the next day I had to reply “next month”. That’s when I decided it was time for shorter trips so I called my Miami old Flight Service Office and asked if I could transfer back to LAD only to the New York base. New York to San Juan trips sounded really great, three days down and four days off. They said “Of course” and off I went to New York City. Click here for Part IV (the final installment) New York! Enjoying every word. In our group here in a Florida there was an English stewardess with PAA, who has written several books, most likely she would have have great memories. Pauline was first a BOAC stewardess and then one of the first to come to the USA for PAA. Your stories are fabulous….love them!! 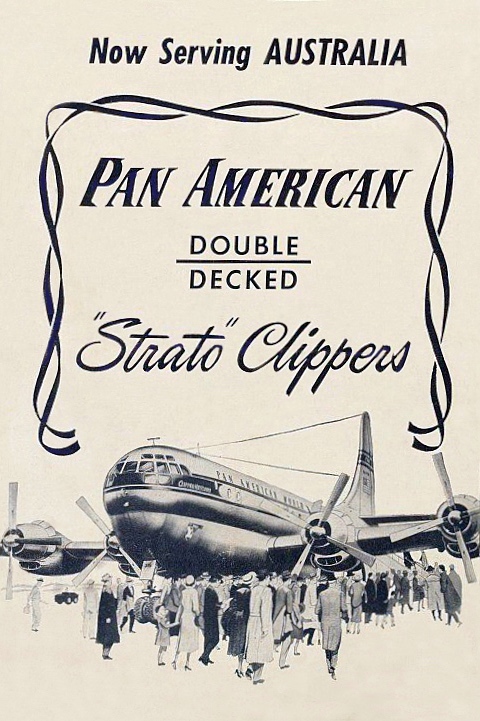 I loved the stratocruiser days….my first six months with Pan Am.